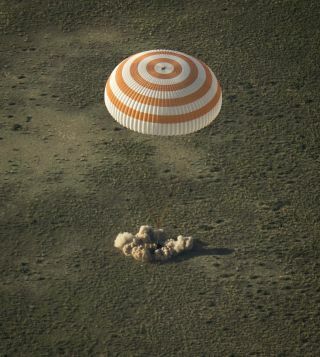 A Soyuz TMA-11M space capsule lands with Expedition 39 Commander Koichi Wakata of the Japan Aerospace Exploration Agency (JAXA), Soyuz Commander Mikhail Tyurin of Roscosmos, and Flight Engineer Rick Mastracchio of NASA near the town of Zhezkazgan, Kazakhstan on May 14, 2014. Three crewmembers of the International Space Station have returned safely to Earth, ending their six-month orbital mission. A Russian Soyuz capsule carrying NASA astronaut Rick Mastracchio, Japanese spaceflyer Koichi Wakata and cosmonaut Mikhail Tyurin landed on the steppes of Kazakhstan at 9:58 p.m. EDT Tuesday night (May 13; 7:58 a.m. local time on Wednesday, May 14). Expedition 39 astronauts Koichi Wakata, Mikhail Tyurin and Rick Mastracchio (left to right) rest after landing in a Soyuz capsule on May 13, 2014. "What an exciting time we shared in this increment," Expedition 39 Commander Wakata said Monday (May 12) as he handed the station's reins over to NASA astronaut Steve Swanson. "Congratulations, and best wishes to the crew of Expedition 40 for a successful mission." Wakata, Mastracchio and Tyurin enjoyed an eventful and historic stint in orbit after arriving at the space station on Nov. 7, 2013. For example, Wakata became the first Japanese person ever to command the station when he took charge of Expedition 39 on March 10. Just four days later, Wakata and Mastracchio participated in "Live from Space," a two-hour TV event hosted by Soledad O'Brien that aired on National Geographic Channel, as well as Channel 4 in the United Kingdom. "Live from Space" gave viewers in more than 140 countries an idea of what it's like to live and work on the orbiting lab, with Wakata giving a guided tour of the $100-billion complex. "It is true that it is unprecedented," former NASA astronaut Ron Garan said of the project at the time. "I've never seen any kind of access like this before. Typically, live events from space run 15 minutes, 20 [minutes] tops. Two hours is just unbelievable." A Russian Soyuz spacecraft is seen docked to the International Space Station, as photographed by one of the Expedition 39 crew members aboard the orbital outpost. Expedition 40 will start with a skeleton crew that includes Russian cosmonauts Alexander Skvortsov and Oleg Artemyev, in addition to Swanson. But the space station will soon be up to full strength once again. Three new crewmembers — NASA's Reid Wiseman, cosmonaut Max Suraev and Alexander Gerst of the European Space Agency — are slated to blast off from Baikonur Cosmodrome in Kazakhstan on May 28.